At some point while I was watching The Good Dinosaur, it occurred to me that I had a choice. I was either going to be the cynical negative guy who couldn't get past the fact that the plot is pretty much ripped from The Lion King and that it had a pretty simplistic story that felt familiar, or I was going to be the guy who let the positives outweigh all of that. The guy who lets a warm, inviting tale of friendship, loyalty, bravery and love wash over me and be able to say sure, this has been done before, but that doesn't mean doing it again was a poor decision. The real obstacle that The Good Dinosaur is forced to overcome is living in the shadow of its 2015 Pixar counterpart, the insanely original and smart Inside Out, a work that at the midway point of December remains one of the finest films of the year. It was impossible and implausible for this film to reach those standards but the comparisons were guaranteed to be there, as this is the first time in the history of the studio that two movies were released over the course of the same calendar hanging on your wall. So I walked in with lowered expectations, asking for entertainment and a fine slice of animation but nothing game changing. I walked out pleased as punch. On a visual level The Good Dinosaur is spectacular. It is probably Pixar's finest feast for the eyes since the dawn of the studio, a wondrous blend of gorgeously rendered animated characters moving through landscapes that feel impossibly real. It's like seeing computer animation roam a nature documentary which sounds like it could be jarring yet somehow it all feels strangely perfect. Even when the story lacked any sort of fresh appeal, I couldn't look away from the images on display. What surprised me most was the ability of the film to strike an emotional chord with me despite suffering from a familiarity complex and having to deal with character interactions similar to those found in WALL-E, where the lack of traditional communication didn't derail any chance of caring deeply and profoundly for the two adorable robots as they are falling in love. Here we have a dinosaur named Arlo and a small, primitive human child named Spot who does not deliver dialogue in the traditional sense and yet he conveys his feelings with surprising ease. 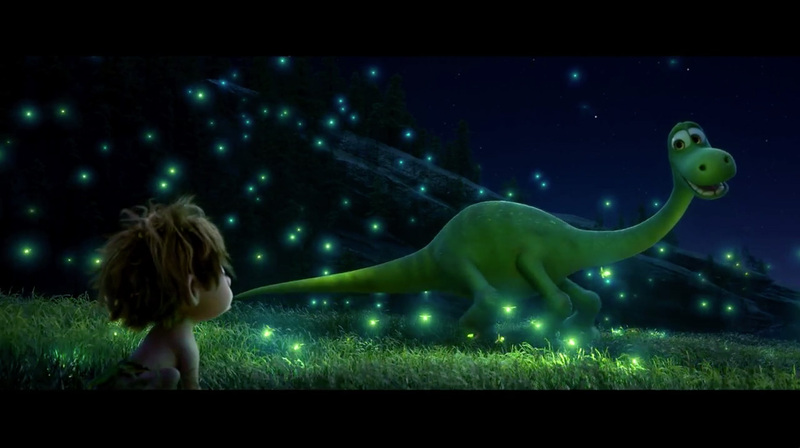 Near the end of the film these two characters are faced with an emotional decision and a tear or two fell from my eyes, and in this moment I realized that The Good Dinosaur had accomplished far more than I ever expected. I genuinely cared. During that same scene, my 8 year old daughter sitting next to me couldn't control the emotion. It couldn't be contained. 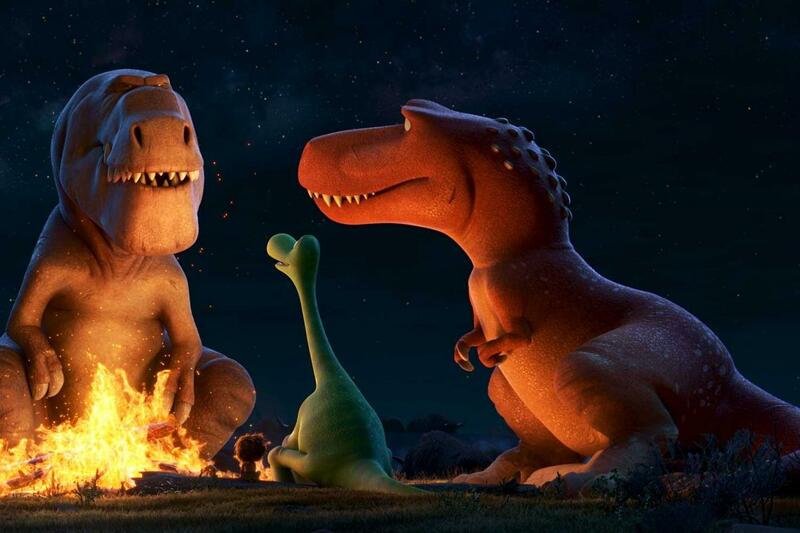 The tears poured from her eyes in a way that had never happened previously during a film, a little girl moved deeply by the friendship between a dinosaur and a boy. While we were driving home from the theater, my wife and I tried talking but we could barely get a word in, minute after minute, block after block, mile after mile the thoughts spilled from her little mouth as she talked about what she learned from the film and how movies aren't just for fun, they also teach lessons. I proudly listened to every word. I smiled the whole way home. Then she said, "I know I am lucky because I have a lot of toys and stuff, but I'm most lucky because I have a family." Cynical? Negative? Not a chance in hell. If this is lesser Pixar, consider us lucky.